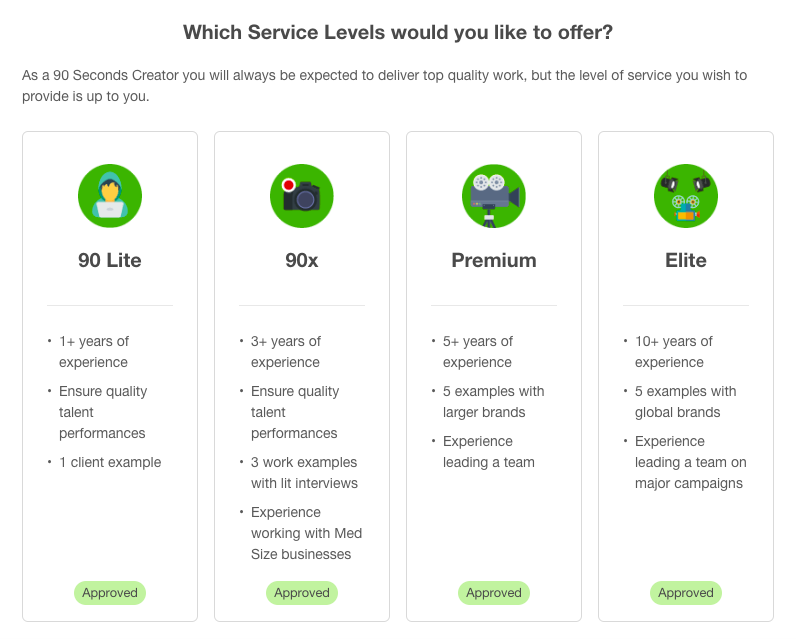 By selecting the level of Service Quality that you can provide, and the Job Sizes that you will accept, you can control what kind of projects (and how many) you will receive. For example, if you agree to accept straightforward jobs that only require basic tools, then choose 90Lite. If you can deliver services at the other levels (each tier escalates in complexity and client engagement), choose them as well but make sure your samples and Bio section demonstrate your abilities. 5. Choose as many Jobs Sizes as you want to receive. By choosing all four, you will be eligible for the most amount of jobs. However, only choose the ones you are willing to accept. For example, only choose "Micro" if you are willing to accept 1 hour jobs. Choose multiple options if you’re looking for the highest volume of jobs. Our Activations team will then review your application and ensure your Service Quality Level selections do not exceed your skills and experience. To qualify for the higher Service Quality Levels, you must provide a link to your work which demonstrates you can deliver that level of service. For example, if you are applying for the Director skill, please provide a description of your directing experience in the bio so we can verify your role in the relevant sample. We recommend taking a moment to check that your profile has the following: a quality avatar showing your face, a detailed summary of your background and gear, and links to your work which showcase your skills. Many creators have set their profile above the rest by including descriptions of how they like to work, the types of industry and genre expertise they have, and the names of clients they have worked with. This is an essential step that must be completed prior to your activation call. Please log in and provide your selections as soon as possible!